The first quarter of 2019 showed dollar volume growth compared to the same period for 2018 in every town except Carbondale. Aspen showed a small growth of 6%, Snowmass Village a huge growth 85%, and Basalt a huge growth of 70%. While during the same period, Carbondale showed a large decrease of 48%. Please see the detailed statistics below. The above stats beg the question what happened to Carbondale. Some of the decrease is due to the question mark attached to the status of the River Valley Ranch (RVR) golf course. 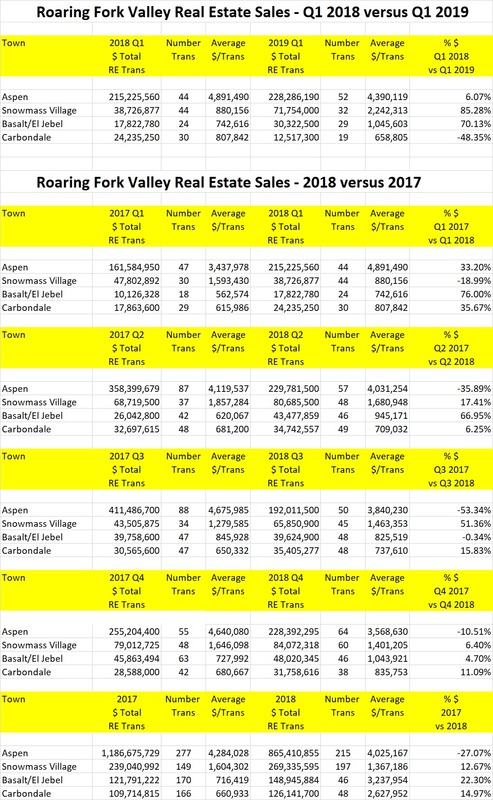 In the first quarter of 2018 there were ten homes sold in RVR, whereas, the first quarter of 2019 only showed two sales. This month, Ryan Anslyn joined Roaring Fork Realty. Like me, Ryan comes from a Real Estate family. His mother, Becky, was one of the top producers in the Basalt market for over twenty years before she retired. Ryan is a past president of the Aspen Board of Realtors and brings a considerable amount of experience to our company. He is a welcome addition.